Spiders are no laughing matter. Especially in Arizona, where spiders like poisonous Black Widows are common. If you’ve found an infestation of spiders or even one Black Widow spider, you should contact a trusted pest control company like Varsity Termite and Pest Control to exterminate them immediately. However, if you don’t want to deal the potential harm a spider infestation could bring you and your family, read on to least about proper spider and pest control maintenance to prevent a spider problem before it starts. Spiders are a type of animal that belong to the arachnid family and live all over the world. The most dangerous spiders in the United States, both of which are common in Arizona, are the Black Widow and the Brown Recluse. It is important to be able to identify these two spiders. Black Widows can be very small or quite large. That are usually a lacquered, shiny black color with a distinct red hourglass shape on their thorax, or abdomen. Brown Recluses are a little bit more difficult to identify. They are much more shy than Black Widows and will often run away if threatened. They are rather large and brown and usually try to stay hidden. Could I have spiders in my house? If you see signs of flies or gnats around your house, there’s a good chance that spiders are also hanging around. This doesn’t have to necessarily be a big problem– Non-poisonous spiders are great at keeping a home free of other pests. However, while the occasional spider may not warrant a call to a pest control service, an infestation of spiders could become a serious issue. Outdoor spiders are usually never an issue, but if you’re finding a lot of spiders inside of your home, there may be an infestation living indoors. A good way to get spiders to move on out of your home is to starve them out. Spiders catch their food through their webs, so knocking down webs wherever you see them is a good way to get them from eating. Spiders aren’t stupid– they’ve leave your house and look for better places to put up their food-catching nets. There are insect killers out on the market specifically for indoor and perimeter applications. You can use these products around your windowsills, baseboards, and doorways to keep spiders from coming back inside. Surprisingly, spiders really, really hate mint. A natural way to keep spiders from hanging around your house is to keep mint potted plants inside. You can also fill a spray bottle with peppermint essential oils (available at most health food stores) and water and spray the mixture around your house where spiders may linger. Peppermint oil is great for keeping other pests out of your home as well. If you’ve been thinking about adopting a cat, this may be a good time to do so. Cats are spider enemies and are especially good at killing them. Eliminating clutter such a stacks of boxes, piles of magazines and newspapers, accumulated junk under the bed, and overcrowded cabinets is a good way to keep spiders out. Spiders, like cockroaches and rodents, love clutter and having space to nest and hide. Cleaning your space up will get rid of their potential homes. Like most pests, spiders love a messy house. Trying vacuuming behind the sofa, nightstand, and around furniture. Dusting ceiling fans, baseboards, corners, bookshelves, air ducts, and light fixtures is also a good way to get rid of a spider’s prime area to hide. If you have cracks in your home’s foundation or in different areas of the house, it may be the right time to caulk or seal those spider entrances. Clean out your chimney when you can– fireplaces with a direct opening to the outside is an easy opening for spiders to crawl inside your home uninvited. Be sure to close your chimney flue when you aren’t using your fireplace. This helps to save on utility bills as well. What’s there to lose? Who can help me with my spider problem? 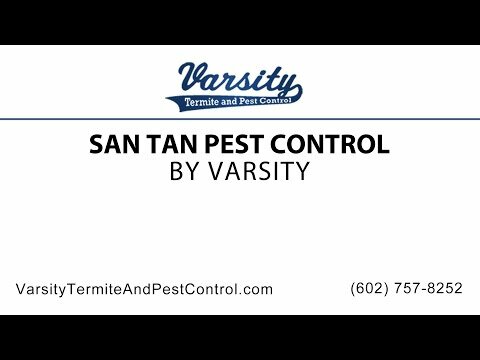 Varsity Termite and Pest Control can! This local Arizona pest control company in San Tan Valley has been provided five star pest control services to the Valley for over twenty years and isn’t ready to quit anytime soon. Our 100% Satisfaction Guarantee exists because we believe that customer satisfaction should be the top priority of every pest control business. If spiders are making your living space unbearable, we’re always showing off special offers for pest extermination on our website. Give Varsity Termite and Pest Control a call today or contact us through our website. Do You Know What Spiders Are Dangerous and Which Aren’t? Read the rest of Do You Know What Spiders Are Dangerous and Which Aren’t? How to Get Rid of Spiders This Summer! Read the rest of How to Get Rid of Spiders This Summer!